Last year, more than 7 out of 10 TVs sold by Samsung Electronics in the global TV market were ‘smart TVs.’ According to market researcher IHS Markit, the smart TV sales in the global market has exceeded 60 percent, which is a significant leap from 35 percent in 2013, demonstrating the growing demand for easy and convenient smart functions. Samsung Electronics is leading the change by strengthening the intelligent function of its 2018 QLED TVs with artificial intelligence (AI) and the Internet of Things (IoT). This year’s QLED TVs have dramatically simplified the consumer process for utilizing their TV, from the first set-up to connection with other devices. What’s more, the TVs are now able to share content with, and control, connected devices. These are the result of Samsung’s efforts to innovate the user experience based on the company’s understanding of consumer usage and by incorporating the intelligent assistant Bixby and the SmartThings IoT platform. The first step, of course, is to get the system set up – by taking just a few simple steps. 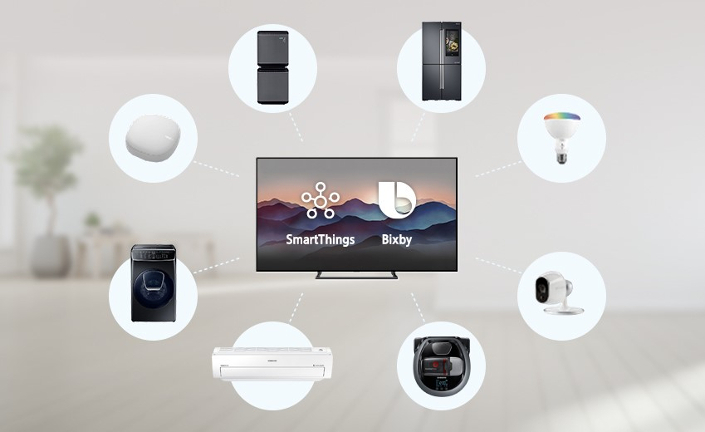 When setting up for the first time, the TV will automatically connect to a user’s Samsung smartphone, or any mobile device with the SmartThings app installed, and take the user to the set-up step. The network information on the user’s smartphone will be shared, instantly connecting the TV to the Wi-Fi network it is connected to. If the user’s mobile is already linked to a Samsung Account, that information will also be shared with the TV. Users can also select their apps of choice from their smartphones to enjoy them on Smart TV, and their favorites can also be added to the launcher for easy access. Once set up is complete, users won’t have to worry about it again. Unlike in the past where users had to sign in to each app on the TV, the Effortless Login feature will share and store the login information from a users’ mobile in the 2nd half of this year. The QLED TV allows users to instantly access their favorite social networking or music streaming apps. According to a survey by business solution provider CSG, 9 out of 10 consumers already own IoT devices, and half of consumers expect IoT to make tasks easier around the home. But, the process of connecting the TV to the peripherals tends to be a hassle for many. 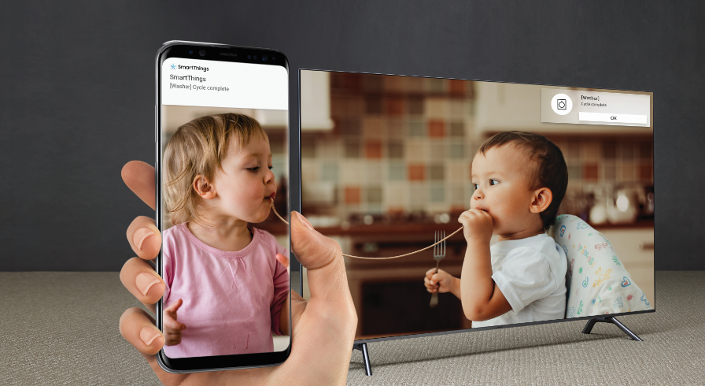 The 2018 QLED TV has tackled such challenges once and for all with ‘SmartThings,’ an integrated IoT platform that’s available now. Users can run the SmartThings app on their smartphone and click ‘Add Device’ to automatically find all the IoT devices in the house that users can connect to. When turned on, SmartThings detects IoT devices at home ranging from traditional home appliances like washing machines and air conditioners to baby-cam, lights, doorbell, and locks. Device information in these connected homes can be viewed at a glance on the TV using the SmartThings Dashboard. The TV immediately becomes the control tower of the living room. Users can, for example, operate the air conditioner after checking the home temperature. Or check the remaining laundry time on the washing machine. Users can also choose to charge or run the PowerBot robot cleaner, and take a look at what ingredients are in the Family Hub refrigerator. TV has made it easier than ever to review the pictures and videos taken on a smartphone through the Gallery app. 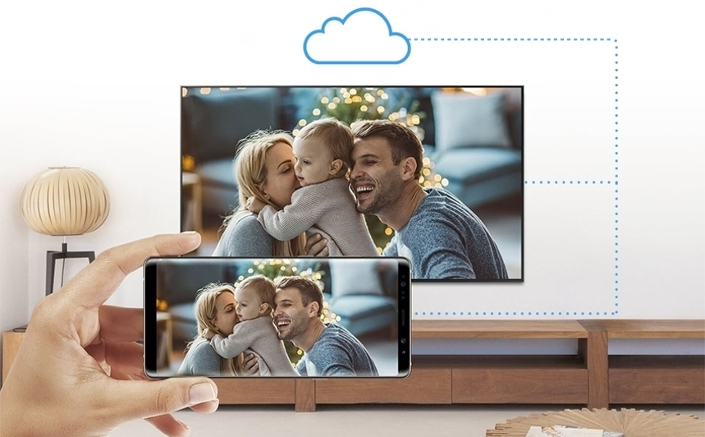 Photos and video clips can be uploaded on Samsung Cloud which is connected to the user’s Samsung account, ready to be viewed on a big screen. When you take a picture on your mobile while you are traveling, you can immediately share your memories with your family as soon as a notification is uploaded to the TV. The Gallery app enables users to share the same content on the family hub. The QLED TV will play the role of a special mediator in the living room to help family members communicate easily on a deeper level. No More Multiple Remote Controls. Just Speak to Bixby. The QLED TV has been equipped with ‘One Remote Control’ function which can control various peripherals with one remote control. In particular, this year, it supports not only game consoles, OTT (Over the Top) boxes and speakers, but also audio products connected with optical cables. Bixby Voice also helps make navigating the QLED TV easier. By pressing and holding the remote control voice recognition button, it is possible to search content as well as set up a TV without having to operate it several times. 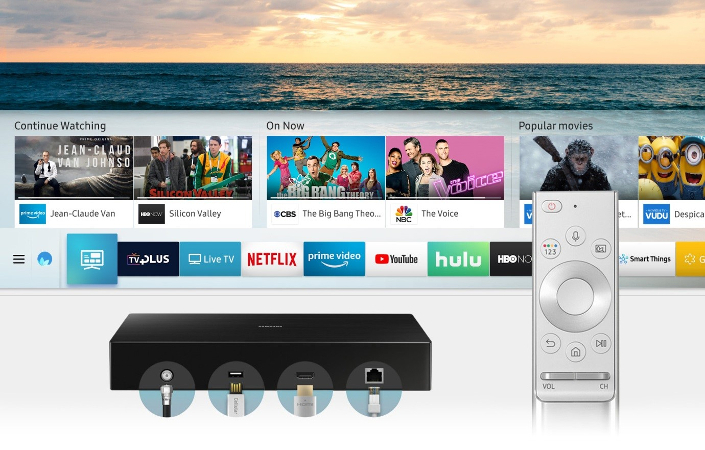 It is a strength that users can find various VOD (Video on Demand) contents such as Amazon, Hulu, and HBO as well as the contents of the set-top box. Users can also get additional information like the soundtrack while watching TV. For example, say “What is this song” to find out what music is playing in the background. Also, devices connected on SmartThings are voice-controlled. With Bixby, users can have a home IoT experience where everything flows smoothly.